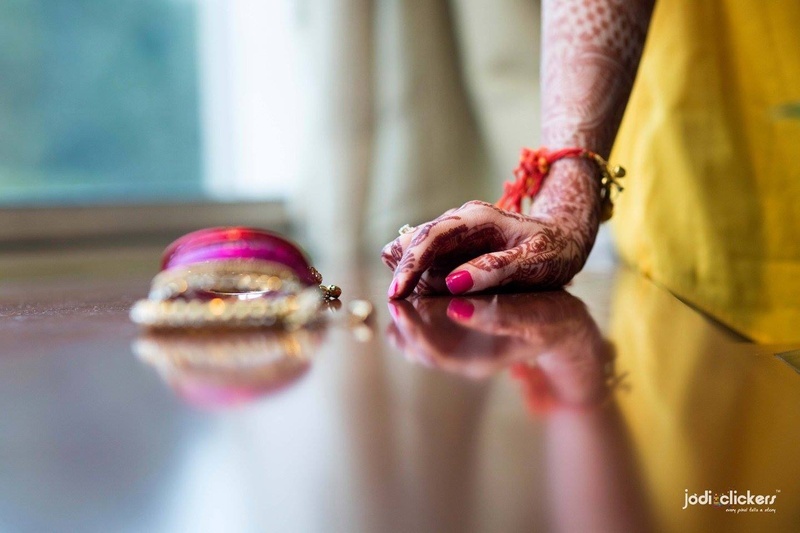 A wedding filled with bucket loads of romance so perfectly spilled through photographs captured by Jodi Clickers! 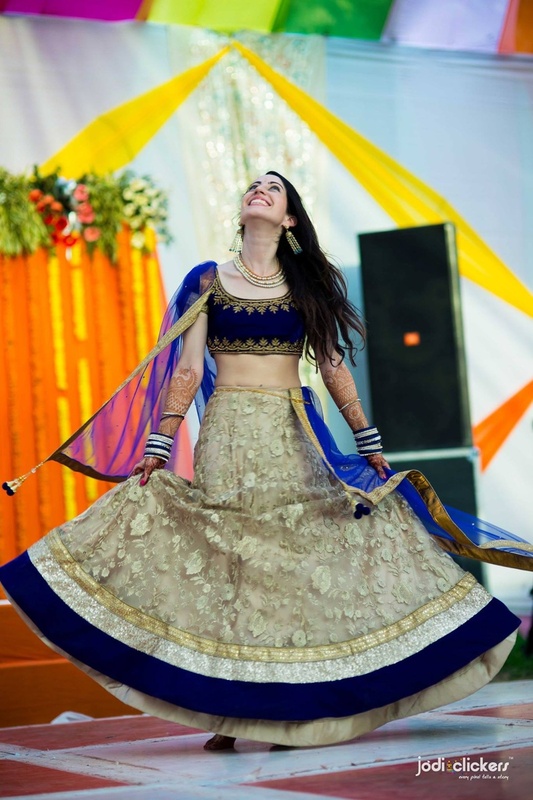 Stunning outfits, stunning jewellery and (you guessed it) a stunning bride – this wedding was one BIG celebration of love with beautiful outfits, of course. 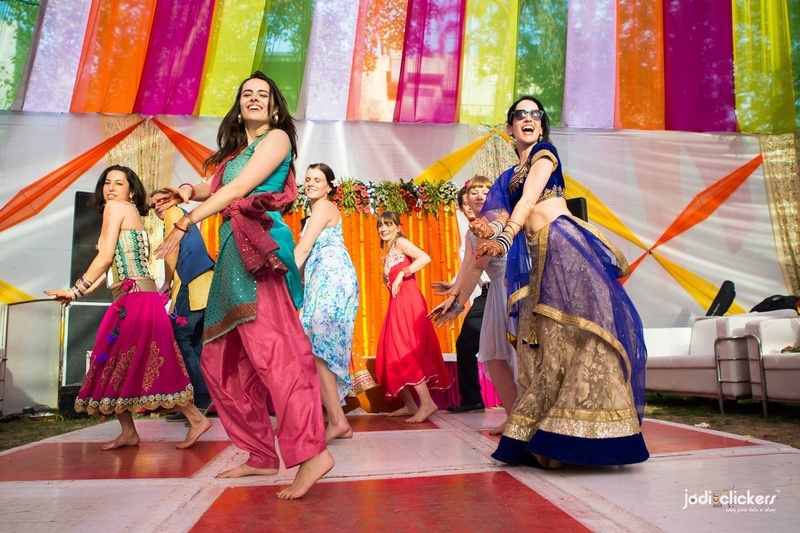 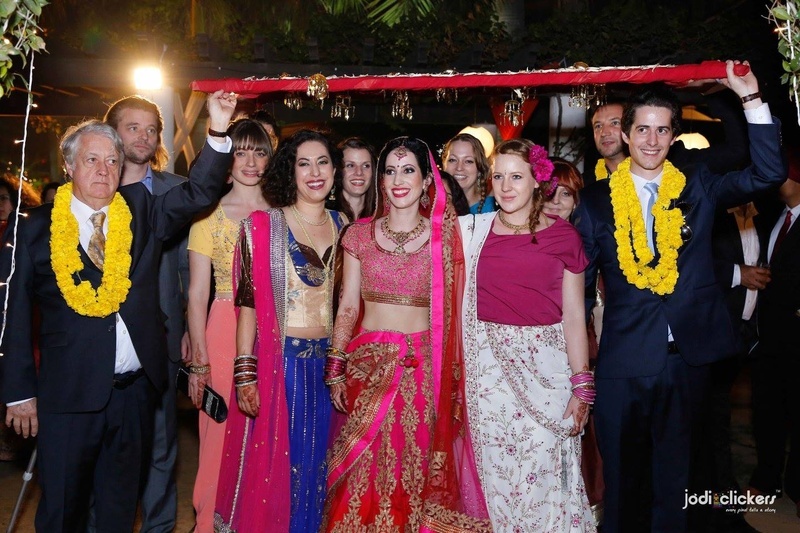 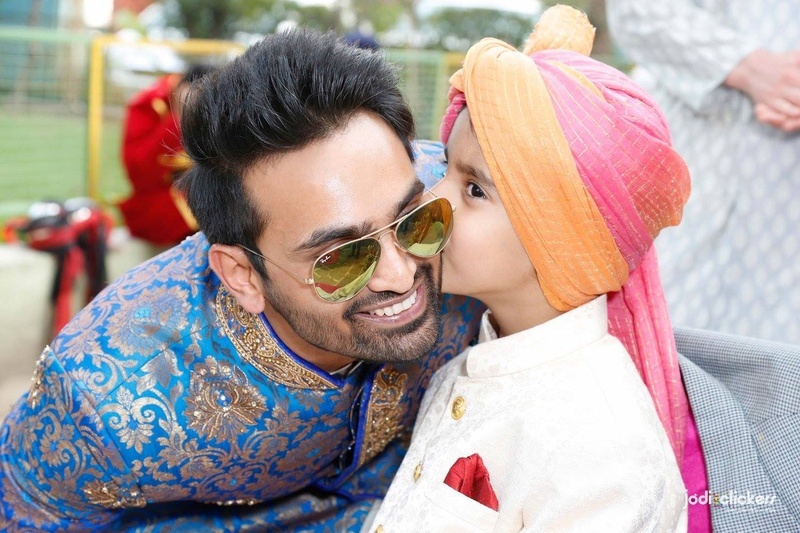 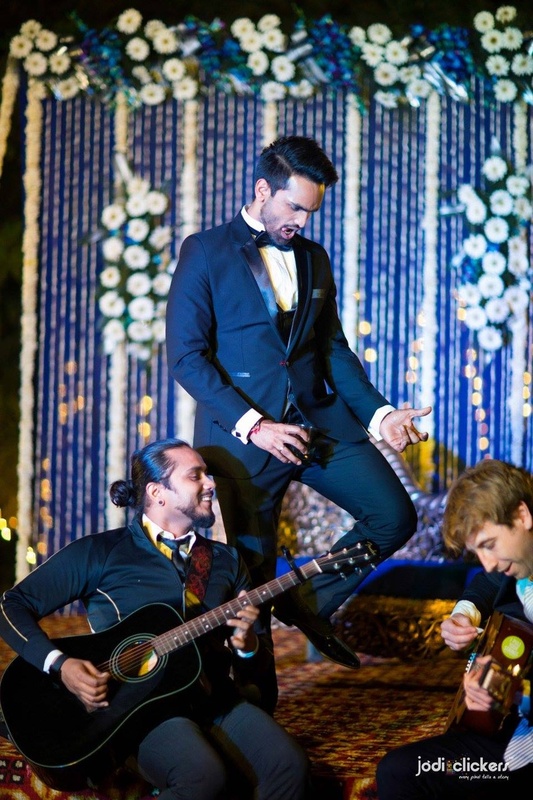 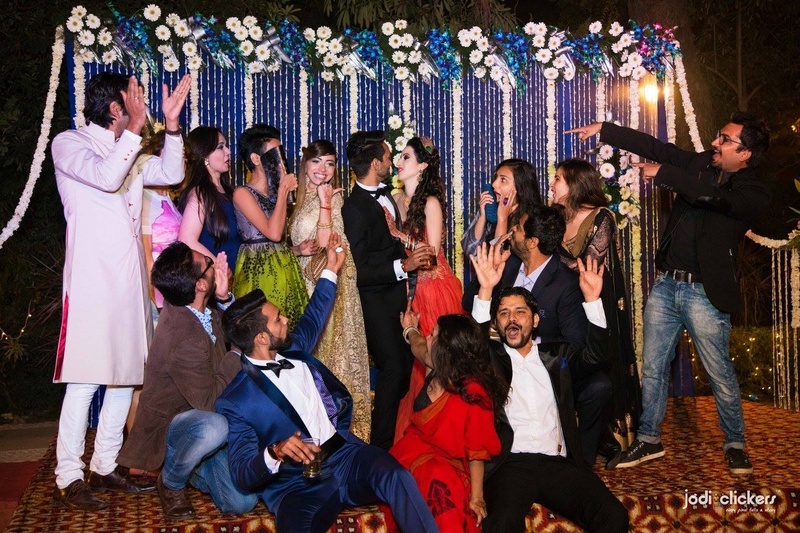 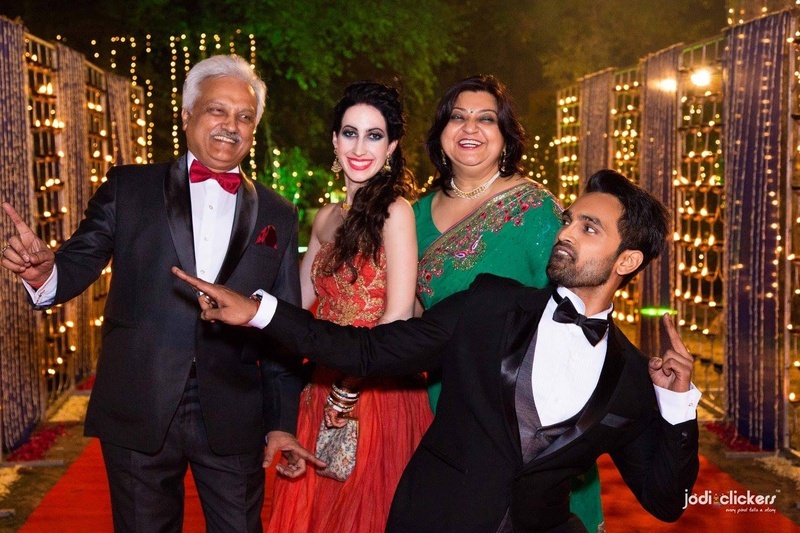 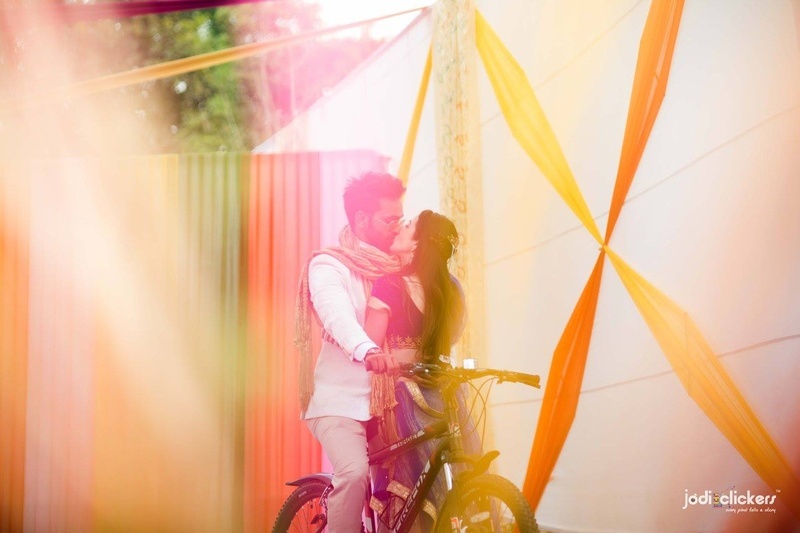 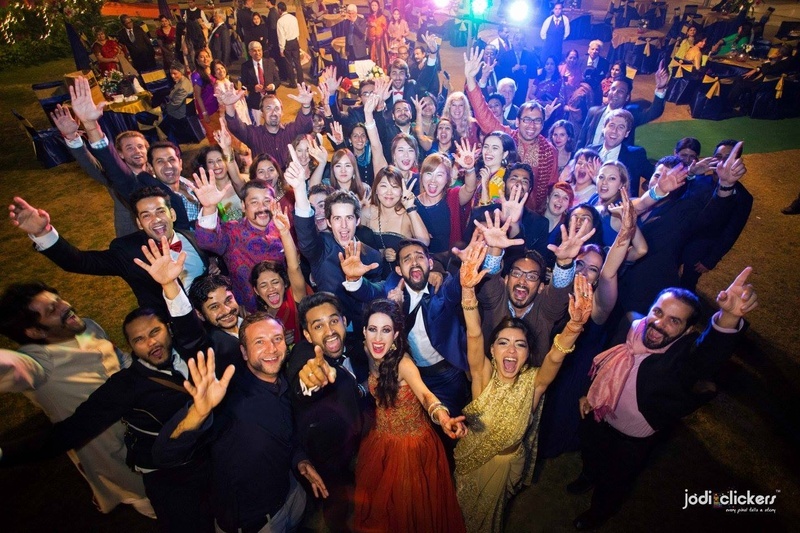 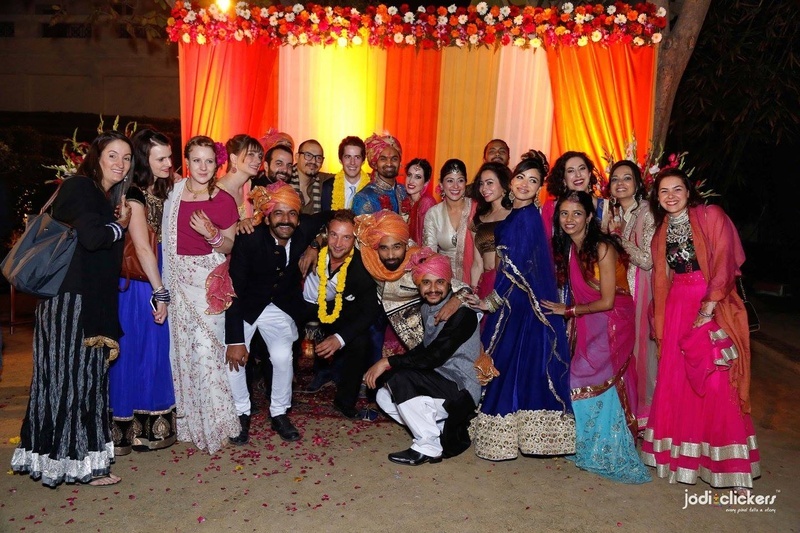 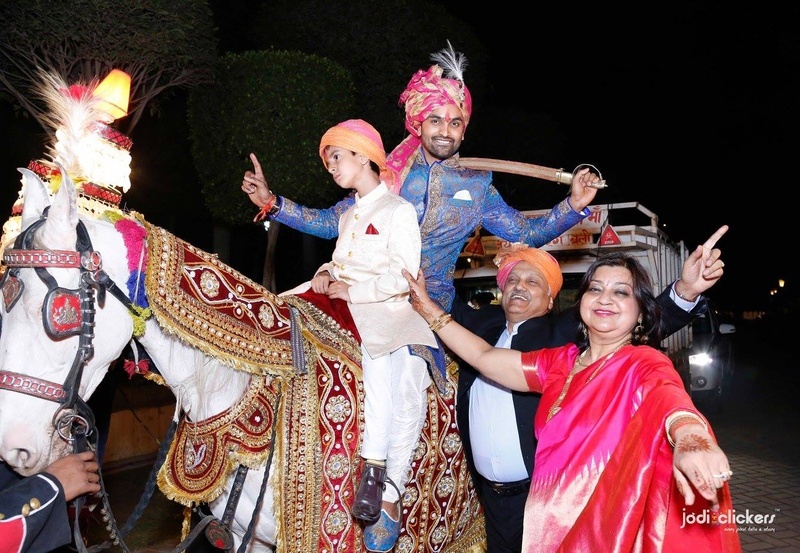 An all outdoor wedding – the sangeet, marriage as well as the reception was all held under the open sky. 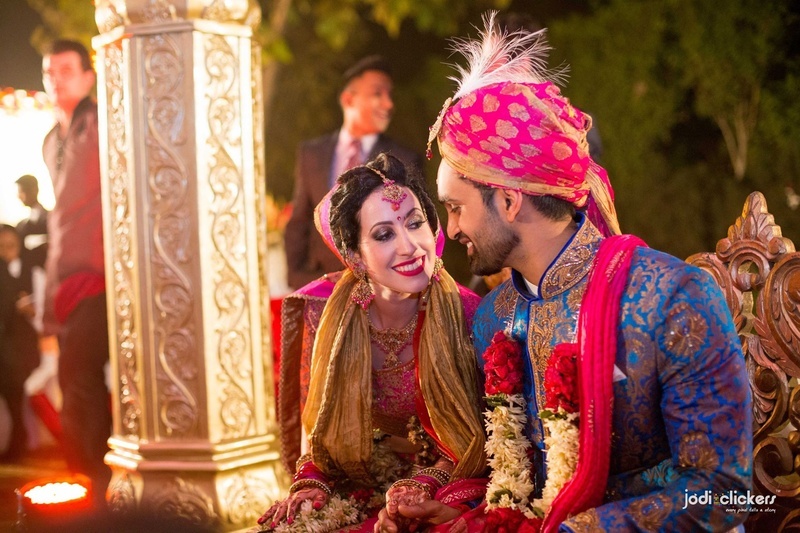 Bright drapes for the sangeet, golds and reds for the wedding and a royal blue theme for the reception – each aspect of the wedding was done with maximum taste and style. 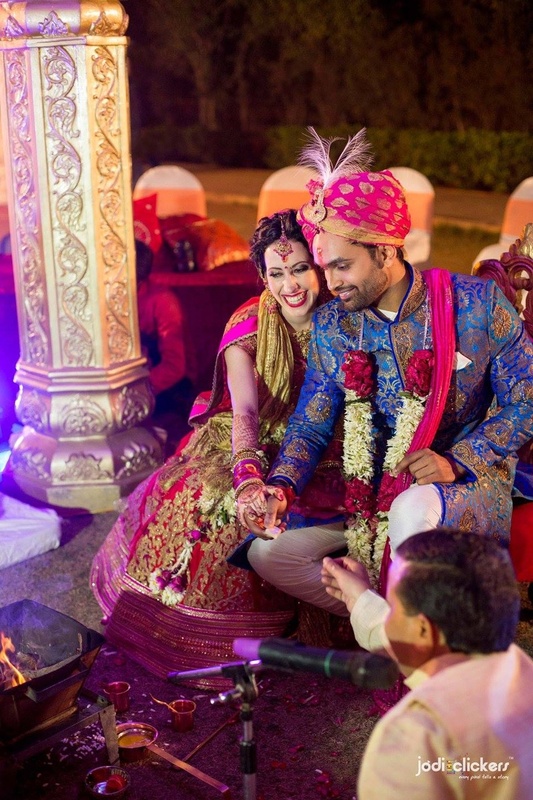 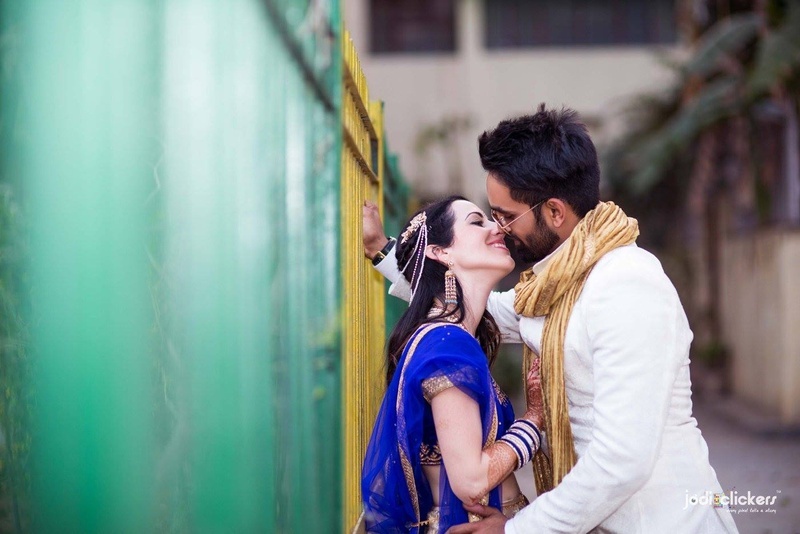 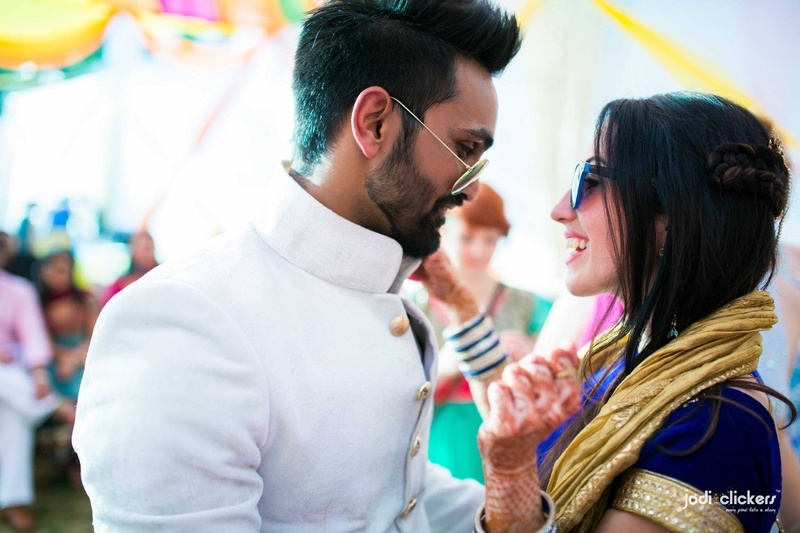 Dressed in a stunning red and pink ombre wedding lehenga that was intricately embellished with zari motifs, crystals and thread work, Olivia walked graciously under a bridal chaddar, with her heart willing and ready to take her Saat Pheras with Salil. 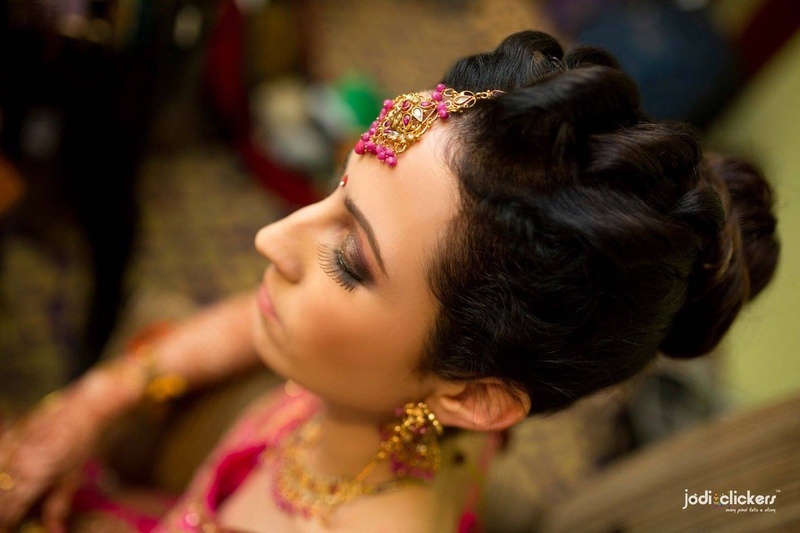 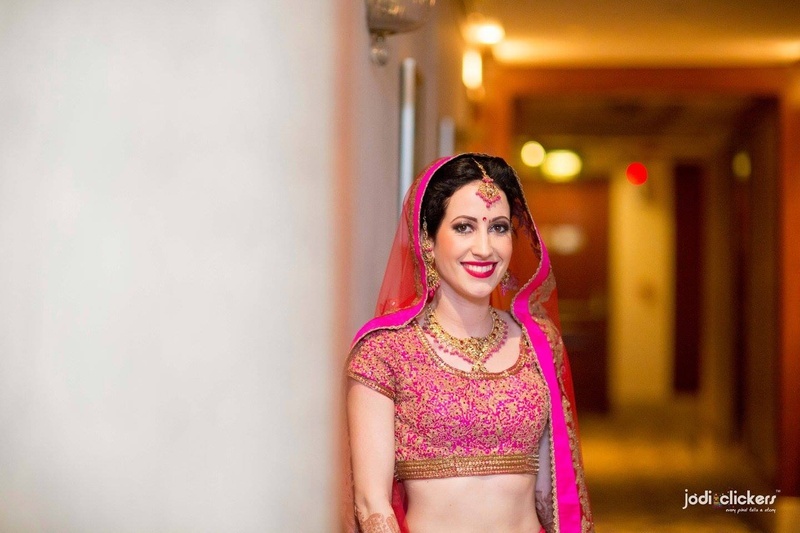 One of our favourite things about cross-cultural weddings is how either partner completely embraces the culture of the other – and this stunning bride right here is proof. 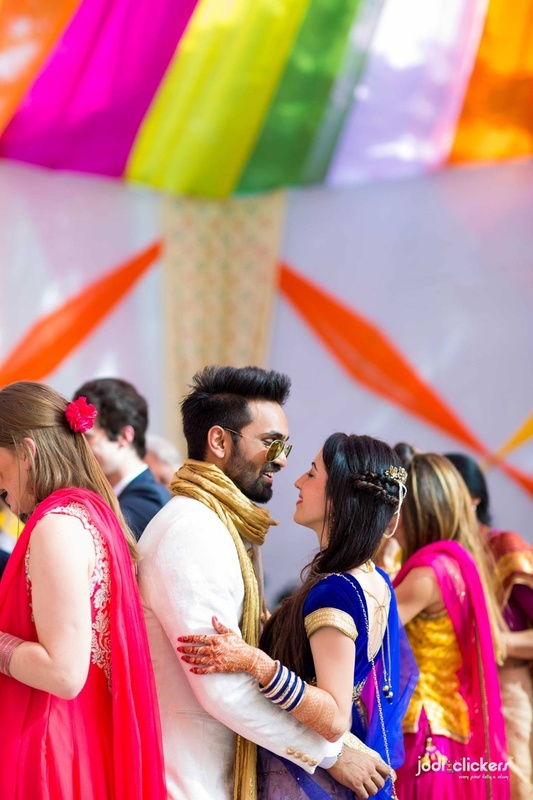 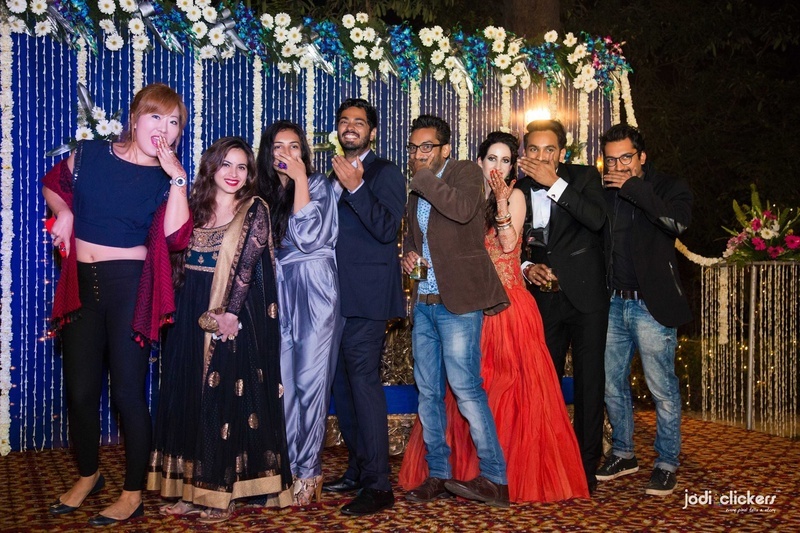 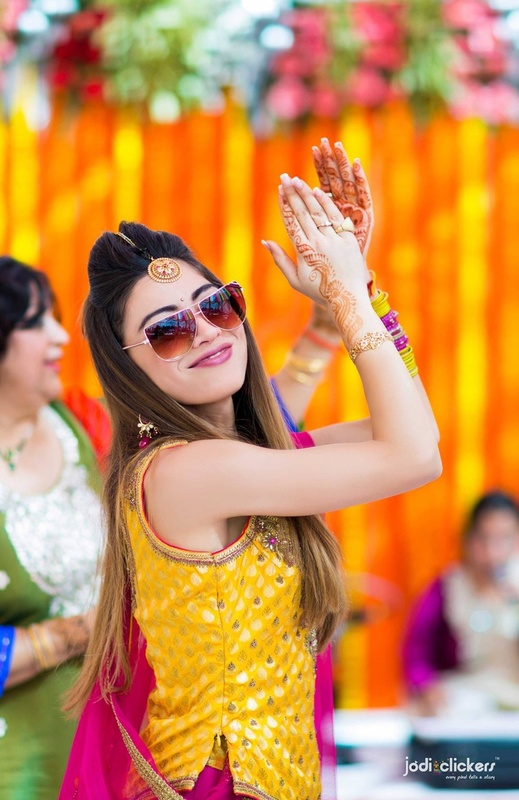 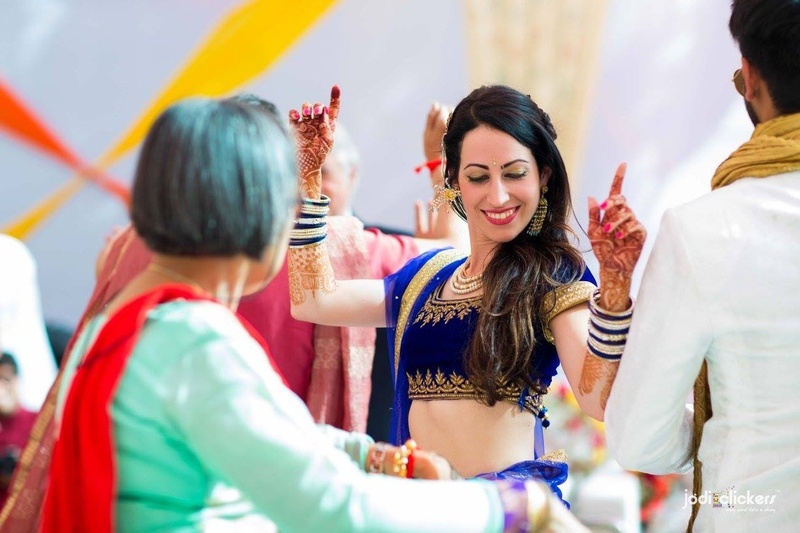 Whether it was showing off her thumkas at the reception or the uber fun ring finding ceremony – this bride did it all, and did it so enthusiastically! 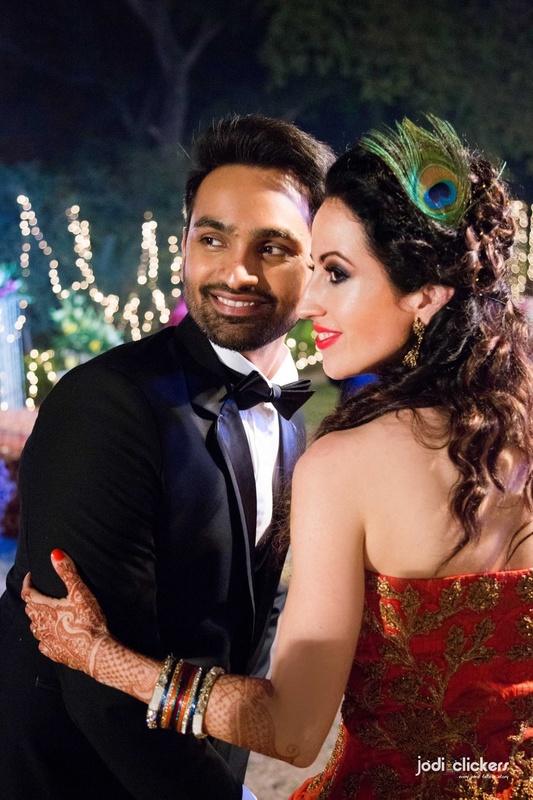 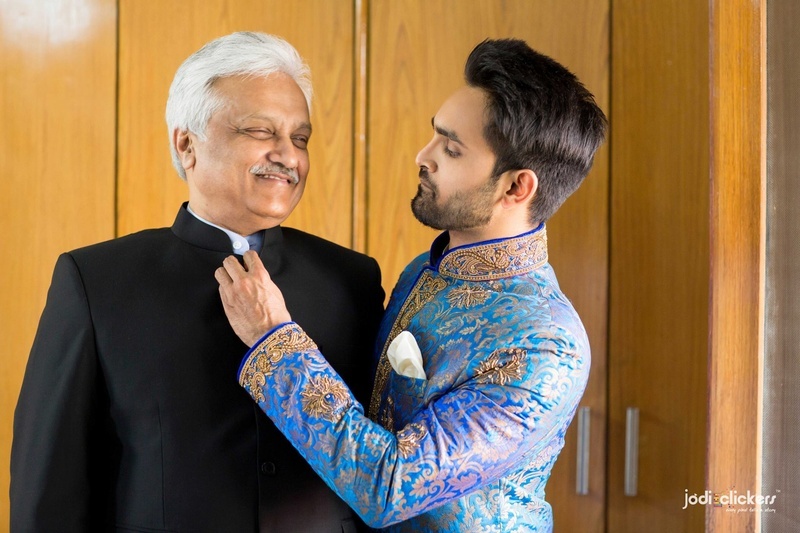 What to look out for as you scroll through this beautiful wedding album – the vivid sangeet décor that is so DIY, Salil’s pink and gold safa and the bride’s peacock feather hair accessory – so different, so good! 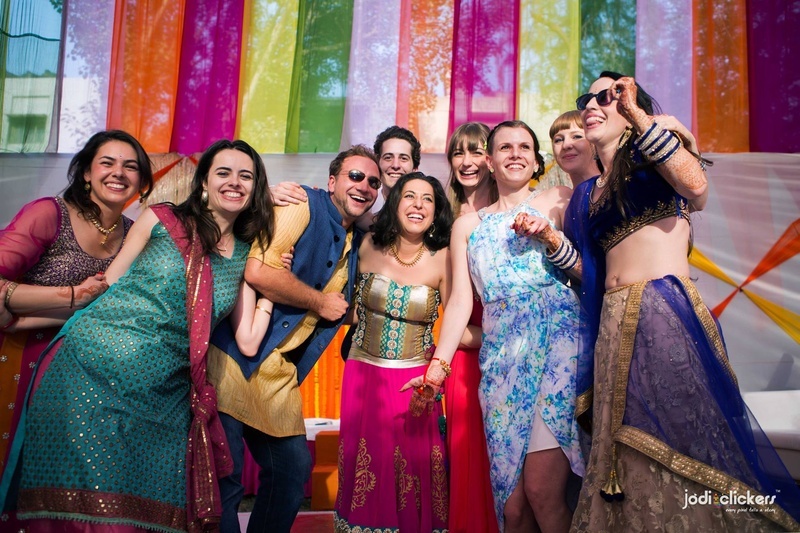 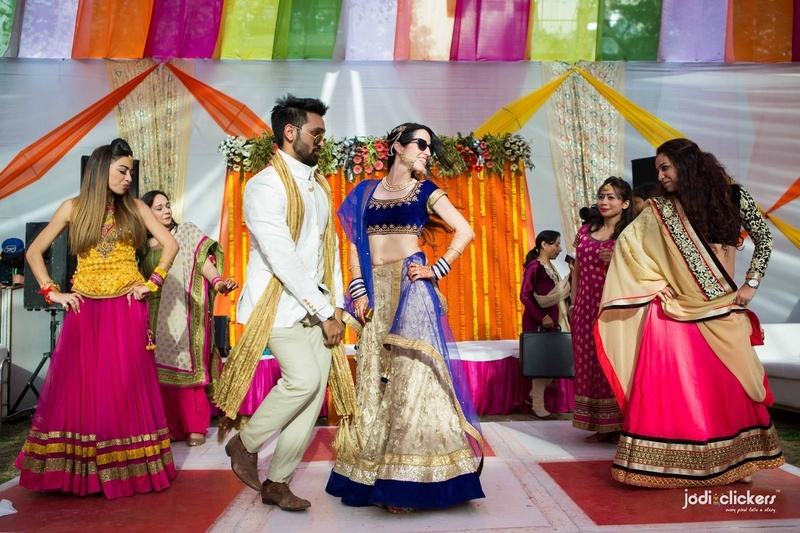 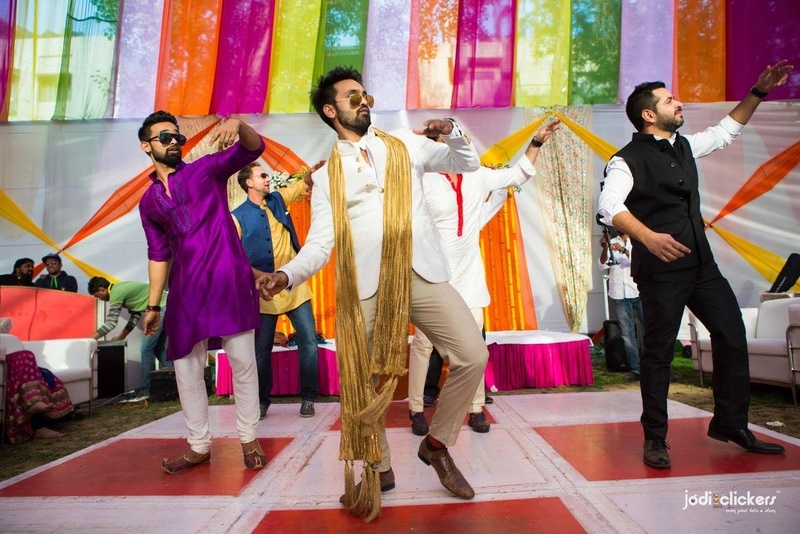 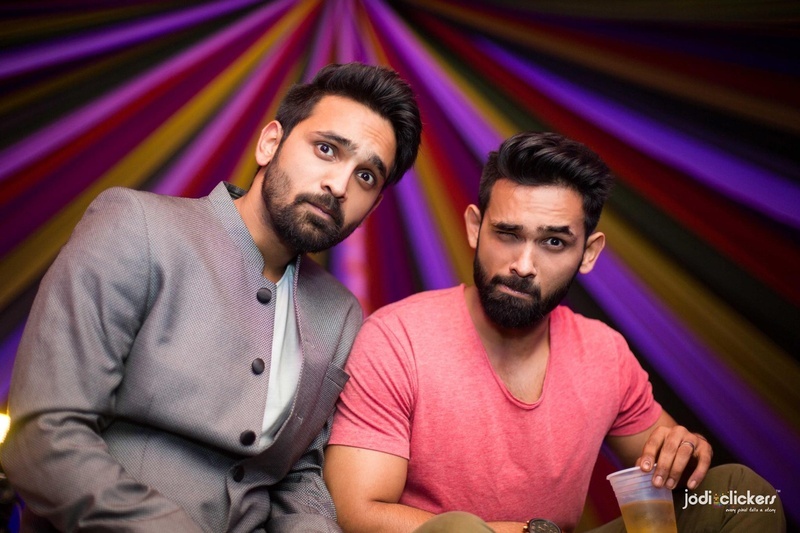 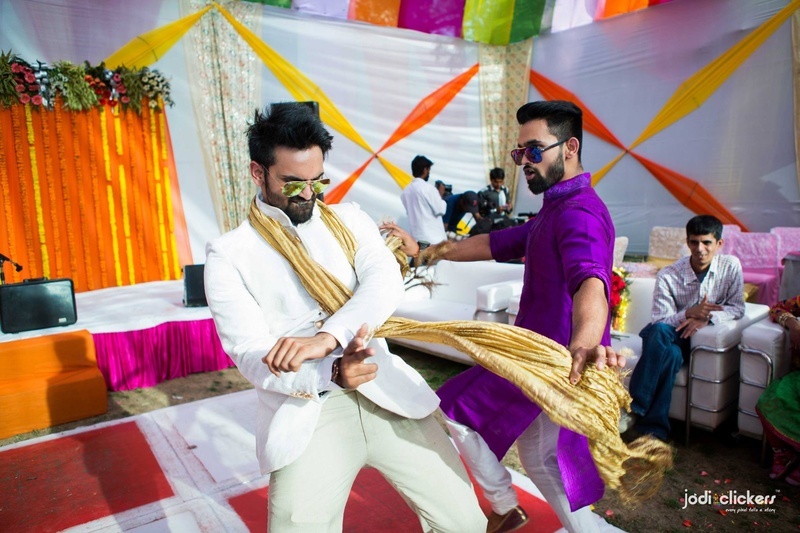 Oozing the dance floor with some desi latka-jatkas! 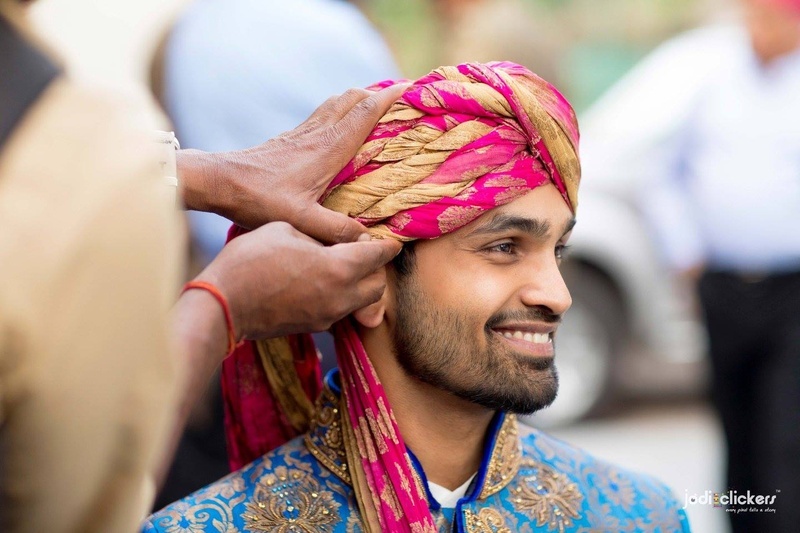 Performing the wedding ceremonies, going all smiles! 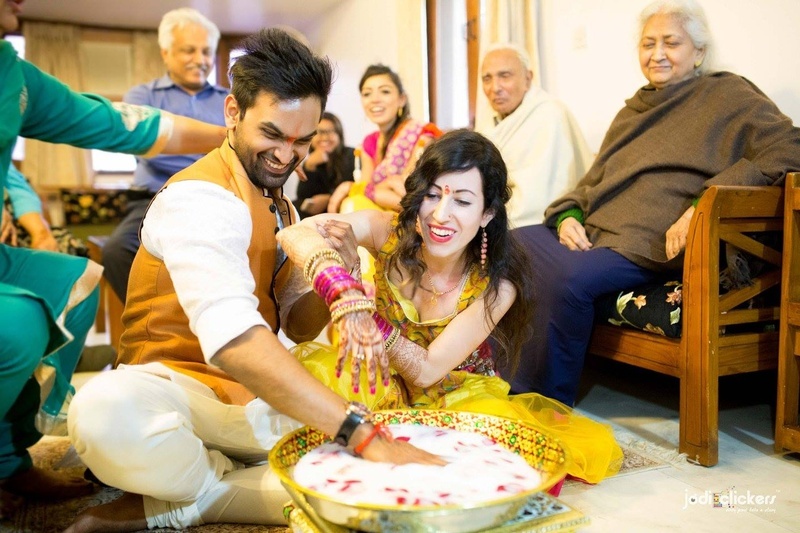 Excited and happy they are, and why not!